Ever wanted to make a video game? It’s always been my dream to make a video game. Currently I want to make a video game based on Tower of God an (excellent) korean webtoon, if anyone is interested in working on it with me, I am looking for people who speak korean (so that I can talk to Slave In Utero author of the webtoon), A fondness for video games (so that I can discuss ideas for game elements), People familiar with the webtoon, and Coders (maybe? I want to do most of it myself) I don’t plan on making money on this, but that doesn’t mean I won’t try, if I do, I’ll compensate people and if not credits and the ability to say “I made a video game WTF have you done with your life” are always good rewards, anyone want to help? Anyway, I was thinking that Shannaro needed a place to discuss our favorite manga other than the big three. Given that most manga are “adventure” type this is the largest list. I love Tower of God for it’s plot, Hunter X Hunter because of the battle system, Magi as an all-rounder, and Full Metal Alchemist for the plot. 1. Psyren: The battle system is excellent, there is a happy ending, and even the villains are believable. 3. Aphorism: Every character has a “character” on there body. They can summon any image of this character and must use it to survive a monster filled high school for one year. 4. Gantz: Monsters/Aliens invade earth, but one man in a metal sphere reclaims the lives of the dead to fight them. 5. Trace: Monsters invade earth, but people develop supernatural powers to compensate and fight them off. I am always looking for more good manga to read, so if you have suggestions let me know, though I’ve read more than the 35 on this list, so if you can actually find a good one I haven’t read you might win a cookie. Anyway, this chapter opens with Itachi standing over Kabuto. Itachi uses genjutsu to stop edo tensei while Sasuke laments that his brother will be gone for good. Edo tensei doesn’t seem to be ending immediately as Sasuke and Itachi have enough time to briefly discuss Konoha. Sasuke is STILL outraged for Itachi, even if Itachi himself is willing to forgive Konoha. I find Sasuke’s anger somewhat stupid as he is trying to take revenge for someone who doesn’t want it. However, if he wasn’t an arrogant S.O.B. he wouldn’t be the Sasuke we know and love, then hate for getting such a long (uninterupted) arc of chapters devoted to him. Itachi tells Sasuke that he won’t be the one to change him anymore, and that he has passed that resposibility on to Naruto. Next the scene shifts to the Kage vs. Madara battle. I find this scene an interesting commentary on what happens to the elites when they are pushed to the edge. Gaara and Oonoki use their abilities to protect the other Kage while Tsunade simply goes on a rampage. I feel that Tsunade emboldened by her false immortality is acting similar to how most Edo Tensei Bodies fight due to the fact that she cannot die. The Raikage even tells her she is wasting energy, but she hardly cares, and sense his method of fighting gets him owned by Madara (while he is focusing on telling her how to fight), his words don’t carry much weight. In fact it is Oonoki who seems to be holding the group together (I had a strong urge to throw in a pun about Oonoki and weight but I didn’t) and Madara identifies that he is the one Madara should target (when a few chapters ago he was all focused on Tsunade…). The Kage’s unleash a “final” attack on Madara which consists on a powerfull jutsu from each Kage. Oonoki uses his Dust Technique, followed by a combination water/lightning dragon from the Mizukage/Raikage respectively. While Gaara follows up with a sand attack. (Some of you may be thinking I left out Tsunade, but turns out she provided the chakra for Oonoki, so I guess it can count as a combo, though she does seem to be the most pathetic kage in terms of offence. 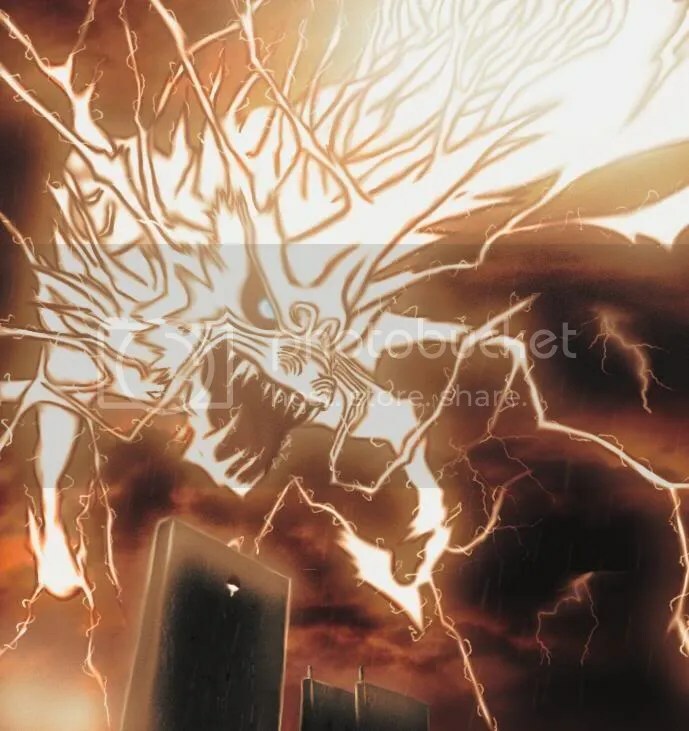 Finnaly when Madara is unable to effectively counter all this with chakra absorption, the chapter ends with him unleashing the “true” form of Sussano’o, though what improvements this has over Itachi’s compleated form, we will have to wait and see. It seems like next chapter and/or the one following that will be a waiting game to see if the Kage’s can outlast Edo Tensei. That said, it’s fairly predictable that at least one kage will die. (I predict Tsunade as a. Madara did say she would be first and b. Oonoki would be the obvious target in this chapter giving the other Kage the “dramatic sacrifice yourself” jutsu option. Hey, it’s been a while since I last wrote anything for Shannaro, so in case you don’t know, I love contemplating battle, battle stratgies and most of all who is the strongest fighter. I’ve read quite a lot of shouhen manga (if you’re looking for a good read other than the top three I like Fairy Tail, Flame of Recca, and Full Metal Alchemist amoung others). Anyway, I love to analyze ninjutsu styles (a.k.a. how ninja use different ninjutsu in collaboration.) One thing I’ve always been disatisfied with was the Naruto Databook Statistics which doesn’t give a great feel for most ninja’s abilities (For instance a high speed or Taijutsu rating is useless against Tobi). Because I’ve also read several other shouhen type manga, I’ve come across quite a few chakara-esq energy forms and thought it might be interesting to compare the forms of ability analysis from those manga to the abilities of ninja. For this post I’ll be using Naruto and Sasuke as my examples. This is a martial art’s manga that occasionaly mentions “Aura” which seems to be closer to the naruvesre equivilent of the killer intent Orochimaru used in the chunin exam than chakra. However almost every (fighting) character can be put through two forms of analysis. 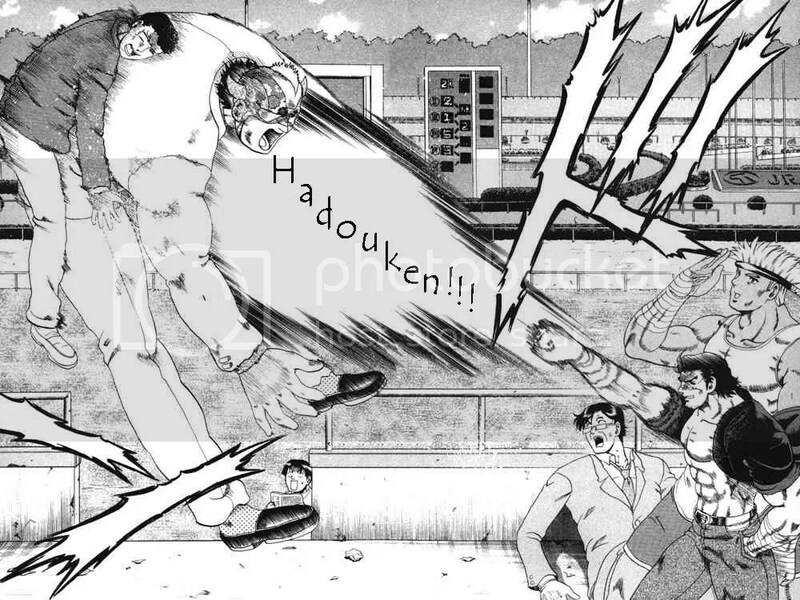 First their moral fighting beliefs: in this manga it falls into either the Satsujin Ken (Fist of Death) or the Katsujin ken (Fist of Life). Second their fighting style: Either Dou (Motion) or Sei (Silence). Katsujin Ken users fight to protect others. They believe that martial arts are a way for the weak to protect themselves from being bullied by the strong. They fight for others and abhore killing. Conversly Satsujin Ken users fight to win. They believe that victory is the only thing that matters and that the weak should die. They fight only for themselves and usually kill their opponents in battle. Sei users are calm analytical fighters that use talent, skill and wit to analyze a foe’s weak point and then exploit it in quick bursts of energy. They are aware of their limits so they use the utmost control to fight within them. Sei users tend to be more defensive fighters. Conversly, Dou users are angry, agressive and even beast-like fighters who attack continously. They use anger and other strong emotions to help them exceed their limits. Dou users tend to be more offensive fighters. If we look at Sasuke and Naruto in terms of Katsujin Ken and Satsujin Ken it seems obvious that Naruto is a Katsujin Ken user while Sasuke believes in the Satsujin Ken. Additionally Naruto seems closer to being a Dou user while Sasuke seems to be a Sei user. 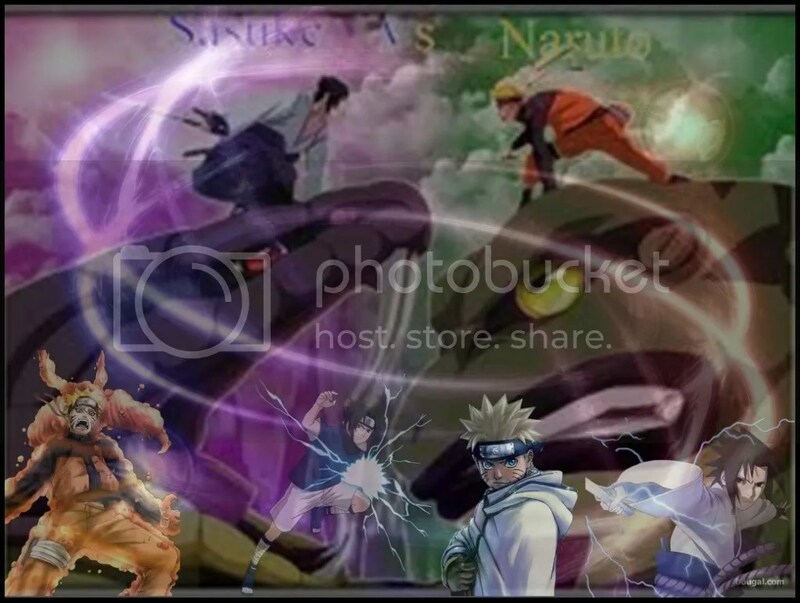 These are just my oppinions though and the classifications aren’t as cut and dry as they are for characters from Kenichi, but I do find in interesting that Naruto and Sasuke are polar opposites in both categories and that they mimic a similar relationship in Kenichi between Shio Sakaki and Akira Hongo. Hunter X Hunter employs the use of a chakra like energy form called Aura, though most of the time it talks about Nen, the ability to utelize Aura in combat. Nen can be split into for categories ren, ten, zetsu and hatsu. Ren, ten and Zetsu are the abilities to see/sense, defend against, and hide Aura respectively. Because most Nen using characters in Hunter X Hunter have some level of ability in each of these fields, the last category, Hatsu, the ability to externalize Aura, is what really sets them apart. Hatsu can be further categoriezed into six different types: Reinfocement/Enhancement (mainly increasing physical abilities such as speed, stamina, or physical strength), Emision (The ability to shoot out bursts of energy), Manipulation (The ability to control objects at a distance), Conjuration (Summoning/Creating an object out of energy for use), Transmutation (Basically their equivilent of nature transformations), and Specialization (Weird unique abilities or abilities that draw from multiple categories) . Each Nen user excells in one type of Hatsu category more than any other. 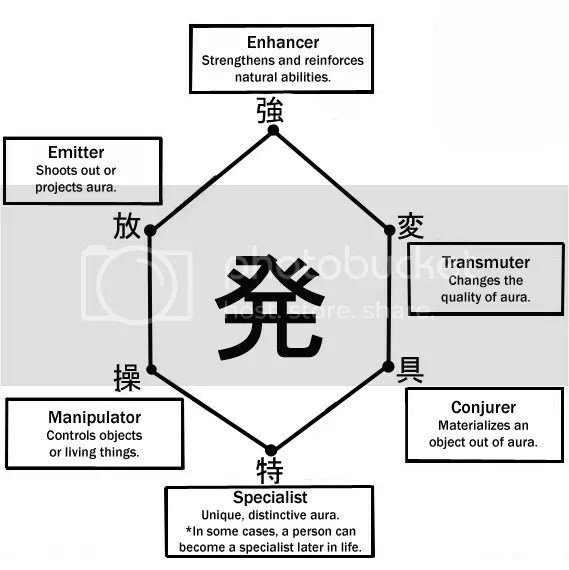 This type can be determined via a Water Divination Test (A test frequently used in Hunter X Hunter that causes a leaf floating in a glass of water to be effected in different ways similar to the chakra paper’s used to determine that Naruto had an affinity for the Wind Element) or generally by personality type, which generally coresponds to a particular Hatsu specialty. Similarily based on their main type they will be better at certain types of secondary abilities and worse at others (see chart below). If we look at Naruto, a Nen personality analysis points to him having the “Simple and determind” mentality that most enhancers have though a case could also be made for the “Impatient and not detail oriented” mentality of emitters. Therefore it’s not surprising that most of his jutsu fall under these two types ex. Rasengan (emmision), Senjutsu and Jinkuri modes (Enhancement). While his other jutsu seem to stem from his positive secondary abilities of Transmuting (Wind element) and Manipulation (Shadow Clones). Meanwhile his negative secondary abilities Conjuring (Toad Summoning) and Specialization (Kekkai Genkai) seem to be where he strugles more. Again, Sasuke seems to be the polar opposite of Naruto. He seems to be the “typically high strung” conjuror or the “independant and charimatic” specialist. (For the record the two types not discussed are Manipulators who are “a logical person who advances at their own pace” and Transmutors who are “whimsical lyers” which oddly enough seem to fit Sakura pretty well.) This seems to fit Sasuke to a T as his multiple high class kekkai genkai certainly make him a specialist, and while he might not show any particular aptitude for summoning (given how much of a broken character he is, since he can summon snakes, hawks, sussano, and amatseru (does that count?) ) but is great at it’s secondary ability Transmutation (Fire, Lightning, and Blaze elements) as well as pretty good at Manipulation (Tsukyoumi or whatever his genjutsu is) further more he has always had problems with keeping up with Naruto in terms of chakra reserves (well who wouldn’t?) and thus had trouble with Emision and Enhancement. I find it kind of awesome and kind of scary and kind of awesome that Yoshihiro Togashi’s system of analysis fits Naruto so well. I think his manga Yu Yu Hakashou and Hunter X Hunter are great reads (Don’t watch the Hunter X Hunter anime though because the story is dull in the first arc and the anime cuts out the few parts that make it worth getting through). Anyway, I hope you enjoyed this post, and if anyone knows of a good shouhen manga I’m very interested as I’ve read pretty much all of them. I’ve got another blog, I’m bored and making up for lost time. My long term favorite ninja has always been Kabuto. I’m talking about from the moment he was introduced (because I liked his intel card jutsu). He’s always been hard to figure out and always made things interesting, from saving Hinata only to knock Kiba out to transplanting Orochimaru’s arm into his body, he just makes moves you don’t see coming. He’s not some predictable “super hero” like Naruto or an emo antagonist like Sasuke. Much like Itachi he leaves lots of little details behind for the reader to try and guess at his motives and intentions. 1. His birth: This isn’t currently relevant to the story, but I feel like when we finally see the Kabuto backstory it will resurface and be an integral part of his motivations and powers. Kabuto was found among a pile of dead bodies at the battle of Kikiyo Pass. During the Chunin Exams he thought to himself that if he continued fighting the “Real me (Kabuto)” might come out. This could just be referring to the Jounin level skills he actually possessed but it might also imply that he has some form of kekkai genkai or special ability and that he was the one who killed all the bodies that surrounded him (He could have also been doing this as a brainwashed slave of Sasori but it seems like he was too young for that). I’m hoping that he has some ability he hasn’t shown yet that isn’t just an Orochimaru rip off. 2. His allegiance and goals: This is by far the biggest question about Kabuto. He has been brainwashed and traumatized so many times that I’m not even sure he knows where his final allegiance will fall. Even though he was supposedly released from Sasori’s control, it’s quite possible that Orochimaru missed some subtle personality change that Sasori created or made one himself that fundamentally altered who Kabuto is and created a form of incepted (root word inception) duplicity that causes Kabuto’s erratic mind states. Not to mention the effects of implanting Orochimaru’s arm into his body or the long years of dehumanizing experiments. His psyche is obviously one of if not thee most fragile in the whole story. There are several options for where his allegiance lies. A. With Himself: He could just be a power hungry villain. This is probably the easiest option to accept. He doesn’t care about anyone but himself and only wants as much power as he can get. This option leaves one question though, What does he wish to do with this power once he obtains it? He is currently responsible for killing thousands of ninja from every one of the five great ninja villages and is the second most wanted ninja alive. He could form his own village like Orochimaru, but Kabuto doesn’t seem the type (to me at least.) I just can’t see an end game here. B. With Madara: His temporary ally. I don’t think he has any long term plans for affiliating with Madara. It is fairly obvious that both plan to backstab the other and take their resources the question is simply who gets there first. C. With Konoha: This is an interesting option to consider. What if his end game is to position himself to take down Madara? Or more realistically he realizes that there is no end game situation he likes in situation A and opts to pretend that this was his motive all along and leverages killing Madara for sparing himself. (Inspired by Naruto’s determination of course since most Kage would buy that hook line and sinker.) He can then use actions like giving Naruto intel on Akatsuki and leading Team Anko and keeping Anko alive as further proof. Then explain that using Edo Tensei was simply an act to get in with Madara and a necessary evil to take him down. “Reformed” of his former ways he can then use his power (and Sasuke’s eyes) to do as he pleases. It would also probably help his case that he is strong enough to almost single-handedly take on all five great shinobi villages at once which means accepting him minimizes a powerful threat and gives significant military power to his allies. D. The Sound Village: You always have to wonder what ever happened to them after Orochimaru (and the sound four’s) death. Who is there to lead them? With Sasuke ignoring them the heir apparent seems to be Kabuto (since he is literally half Orochimaru anyway). I think however that after Hebi’s formation Kishimoto has forgotten them. (until one of his subordinates reminds him and he uses some plot hole jutsu to bring them back in.) You also have to wonder if they aided Kabuto in obtaining the DNA samples. 4. His hidden body: Obviously someone related in some way to Tobi. This almost guarantees strength because who can run with Tobi besides world class ninja like those in Akatsuki, as well as make him feel fear? I personally hope for the sage of six paths or Madara’s brother. I’m also hoping he brings back Danzo in order to use Shisui’s eye on Madara (though is that possible?). 5. His power level: It’s really hard to tell what he is capable of. A. he has history’s strongest at his beck and call b. he has all of Orochimaru’s jutsu c. he can heal himself from near fatal wounds and d. he is exceptionally clever. What makes a ninja the strongest? Theoretically any ninja could beat any opponent given that circumstances were tipped strongly in their favor. (for a match up like Ino vs. Nagato it would take a nearly impossible set up, but there is still a possibility.) So what increases their chances? a. Defence: If your opponent can’t win you, you can’t lose. This is a theory of one of the world’s greatest wrestling coaches. The problem with it in the Naruverse is that there really is no “Ultimate Defence” in the Naruverse and only genin have been arogant enough to claim to have one. However we have seen time and again that these defences are eventually breached. If all you can do is defend, then it is only a matter of time before an opponent analyzes your weaknesses and strikes. This is true of Neji’s rotation/Byakugan, Gaara’s Sand, Madara’s Space/Time jutsu, and even (Sasuke’s) Sussano’o. b. Offence: The idea here being the opposite of above. Destroy your opponent before they destroy you. Several, factors come into mainly divided into power and skill. Power is mainly in dealing with an opponent who is also coming at you with an attack, while Skill is more in getting through your opponent’s defences. Offence is an important factor in ninja battles but there is a major downside into going all in in offence, which is the possibility of mutual distruction much like the situation between the secon Mizukage and the second Tsuchikage where the Tsuchikage couldn’t protect himself dispite being able to level mountains in seconds. furthermore if your offencive abilities are purely based on either power or skill the imbalance will create situations where your abilities are useless such as Naruto vs. Madara (maybe not so much now that Naruto has the Kyubbi’s sensing abilities and speed, since he could possibly pull off a situation like Konan’s where Madara has no safe place to go, but I find that doubtfull) or Naruto vs. Shikimaru (where Shikmaru doesn’t really have a fair chance at victory). c. Tactics: Like I said earlier, even Ino could defeat Nagato if the situation was right (say Nagato was paralyzed, drained of chakra, in the dark and had no paths to use). The trick to avoiding this is to never get into that situation. To look at your own abilities and search yourself for weaknesses so that you can improve. This is in my oppinion what makes Itachi much scarier than Nagato despite Nagato’s overwhelming power (If Itachi can pull of something close to Shisui’s genjutsu or some other end-run-jutsu like Sussano, he wins). It’s why Kabuto is so weak at the moment (He doesn’t know his own battle potential or any of it’s side effects and weaknesses. Leaving him open to things like Sasori being freed or Itachi turning on him). It’s why Naruto will eventually beat Madara (because Naruto keeps gaining allies while Madara keeps losing them). d. Diversity/Uniqueness: If you only have one “go-to” jutsu it’s easy to counter because it’s the only thing your opponent has to worry about. Furthermore if you have a jutsu that is simple to understand, inventing a counter becomes easy. However the more complex a jutsu and the more varried your array of jutsu is the harder it is to counter. So which ninja have these qualities, and which can be considered the strongest? What are their weaknesses? Madara: He lacks in power and versatility. 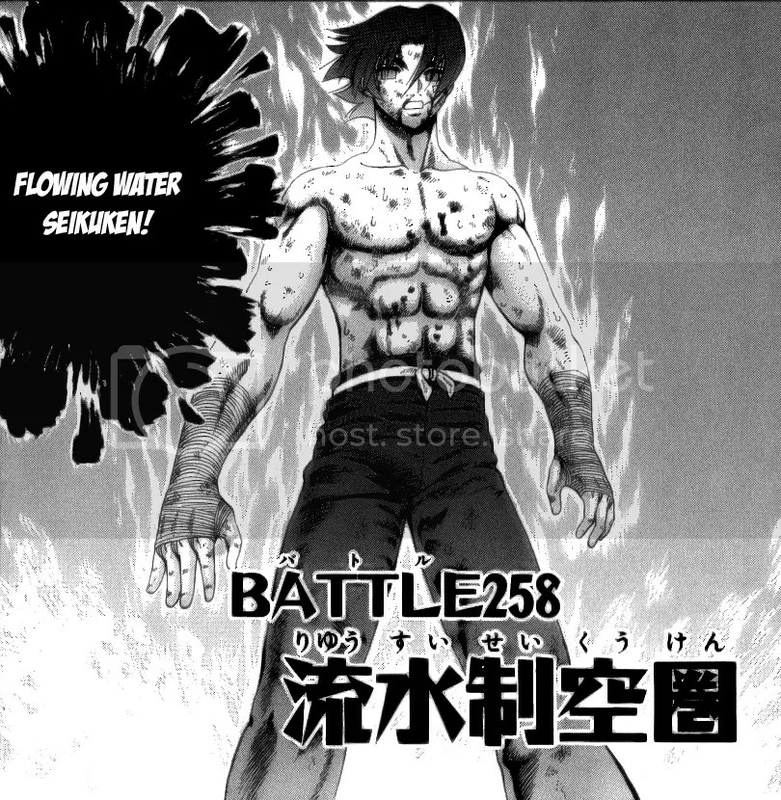 He has a strong defence but has to rely on others to attack (Kabuto, Gedo Mazo, Akatsuki, Sasuke, ect.) He is tactical in the short term, but continously makes enemies and loses allies. He lived in the shadows for years but still isn’t doing a great job of playing his enemies against one another. I think it is only a matter of time until someone figures him out compleatly. Nagato: He has versatility, strength, a good defence, and a loyal companion. His only downfall seems to be his tactics. He can’t be defeated easily, but allows himself to be backed into a corrner multiple times. He also doesn’t seem to understand the depths of his own power, as shown in that Edo Tensei him was able to figure out a mode of mobility that his consious mind didn’t think of (his summons). Itachi: His weakness is in his power. I think that otherwise he is the best in every aspect. This gives him the ability to exploit the weakness of any opponent he comes across as long as he doesn’t fight them head on, which he rarely does. Jiriya: Versitile and Strong, Jiriya has only one weakness, tactics. His jutsu are highly situational, and seem random/improvised. He doesn’t really plan ahead, and just goes with the flow. Allowing his opponents to out manuver him with basic deception. He doesn’t know or cover his own weaknesses well enough that the best he can do is usually self destruction. Naruto: Too much power, not enough skill. If you have a fighting style that can counter lots of shadow clones (basically and area attack jutsu) and Rasengan variations (either dodging or sufficient defence at the risk of being overpowered) then he isn’t much of a match. Usually he just relies on overpowering his opponents with raw power and endurance. If he gets desperate he may use trickery to create a power struggle, but it essentially comes down to the same. He is strong because his weakness is people countering with defencive jutsu, and given his endurance he has enough time to find their weak spot. He would do the worst against end-run jutsu that slip past his attack without considering it’s power and land an attack of moderate strength. Kabuto: He doesn’t understand his strength. Much like Nagato, he allows things to happen that could have been avoided. 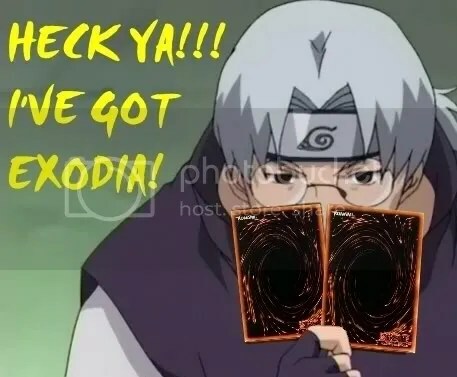 I feel that he has lived in Orochimaru’s shadow too long, and fails to see the big plays for himself. By the time he realizes his full strength all his best summons will be permenantly sealed. His only ace-in-the-hole jutsu being the coffin he showed Madara, assuming it’s strong enough to take on everyone left after his Edo Tensei zombies are sealed. I could analyze others but I will defer that to you with the question, who do you think is the strongest (most likely to win in any given situation)? Mart doesn’t know how to paste a link. Click here.